Ok, now for a blast from my past - I am going to take the time to review one of my favorite games of all time - the Star Wars: Customizable Card Game (or CCG for short). This is a game that I played heavily throughout my high school years, and was really one of my first deeper strategy game. This review specifically will cover the Premiere set, and if I continue re-playing through this game, I might have several more posts that cover some of the expansions. At first, when I was thinking about writing this review, I was thinking about how silly it was to write - after all, nobody was going to hunt down a fairly expensive, out of print game from 15 years ago, right? Well, then I kept thinking about it, and you can currently buy a complete set of the Premiere set on eBay for around $40-50 (if you are patient and willing to buy the White Bordered (Unlimited) version). So, this puts the pricing fairly comparable to Fantasy Flight's current Living Card Games. But, honestly, you'd probably want to buy 2-3 sets or so if you legitimately wanted to play the game (and again, to be fair, I've bought two copies of both the Game of Thrones Living Card Game, and the Lord of the Rings Living Card Game, so we're still not talking too outrageous on the pricing). But anyway - I should review the game now, right? In the Star Wars CCG, two players construct decks and then fight over the universe. (Small task, I know.) 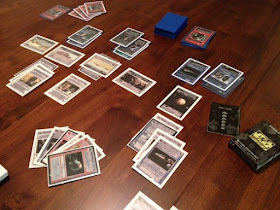 One person constructs an Imperial deck, and the other player uses a Rebel deck. To start the game, each player selects one location from their deck and these comprise the current battlegrounds - after all, there has to be somewhere to fight! 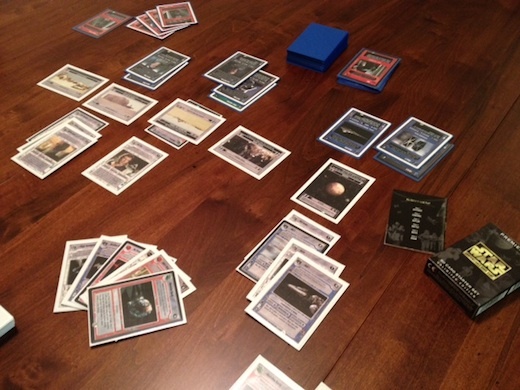 Then, based on the number of "force icons" on the locations in play, on a player's turn, they "activate force" by moving cards from their deck into a different pile called their "force pile." This is the currency with which they will play cards. Second, if a player has control over various parts of the universe, they can drain their opponent of life (this is called a "force drain") - their opponent must discard cards from either his hand or one of the piles of cards in front of him (which are collectively his "life force"). Once this initial turn setup has occurred, the active player may put new cards into play by spending a card's cost in force. Now for the good stuff - a player may spend one force to initiate a battle if both players have forces at the same location. When fighting, each player (depending on how force attuned his troops are) may get a bonus called a "battle destiny." For this battle destiny, you flip over the top card from your deck - each card has a number in the top right hand corner. This number is added to your total strength - but it also represents a battle's attrition, and so it forces your opponent to sacrifice troops (using their "forfeit value" - another stat on each card) to equal the total destiny drawn. Whoever loses the battle must lose a total value equal to the difference in power - they can lose it by using their troops' forfeit value, discarding cards in their hand, or discarding from their card piles in front of them. Next, you can move troops, and finally, you can draw cards from your force pile. Play continues back and forth in this manner until one person runs out of cards in all of the piles in front of them. Note - yes, I simplified this a lot! The next thing that really impressed me is how many different things from the Star Wars universe are represented both in the base set, and in the game as a whole. Now, notably, there are some very important Star Wars characters that aren't in the base set - specifically, R2-D2 and Chewbacca (they are in the first expansion), Yoda (he is in a later expansion) and the Emperor (yet another later expansion). However, in the basic game, you have the ability to fight on land and in space. 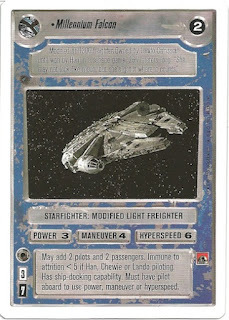 You can travel between different planets through docking bays or through hiring a smuggler (this is an Interrupt card). You have several different weapons (lightsabers of course), and you have fun strategies that you can try out based around Jawas and Tusken Raiders! (These strategies wouldn't have done very well in tournaments, but most likely you're not going to be reading this review, deciding to play it, and then look for tournaments 15+ years after the game came out.) And, they did all of these things well! You have a real feeling of the imbalance between the Rebels and the Imperials, and yet through that you have a very balanced game. For example the Imperials have Star Destroyers - these things are huge and powerful. But, they cost a lot of force to deploy. 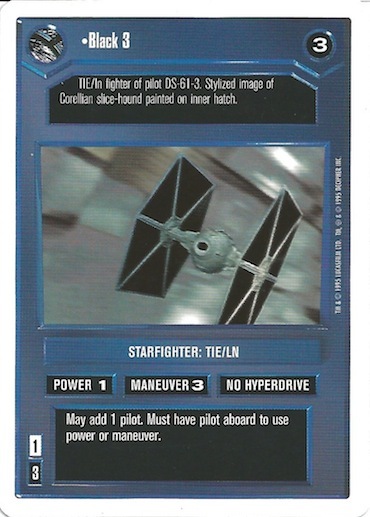 The Rebels, on the other hand, have Corellian Corvettes (which aren't nearly as strong as the Star Destroyers), but they also have tons of X-Wings and Y-Wings with very talented pilots - which are inexpensive to deploy, even as a combination. So, though you might not have the sheer strength of a Star Destroyer, Dutch in Gold 1 and Han Solo in the Millenium Falcon might still be able to take them down due to the attrition rules. My third pro is that I think the use of force is brilliant. It just flat out seems to work better than the currency to play cards in a lot of other games. Since it creates a new pile of cards, its very easy to keep track of your force and how much you have built up over several turns. Also, since you draw your cards from your force pile, you are forced to make difficult and important decisions about how many cards you want to draw every turn. 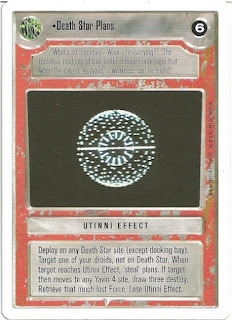 After all, you never know if that last card will be the Darth Vader that you were hoping for! But, the challenging decisions that this flow of force presents become even more pronounced late in the game. When you only have 10 cards left in your deck, you have to decide - how many force will I activate? If you activate too many, you won't have destiny cards to draw in your battle; if you activate too few, you won't have enough force to execute your turn! Though I could continue thinking of more pros and gushing over how much I enjoy this game (I mentioned it was one of my favorites), I guess I will be honest with myself (and you) and mention some cons. There are really two that come to mind, and they are two sides of the same coin (well, then a third one came to mind). One, some cards are flat better than others, and two, this was a collectible game, and so you had to buy zillions of packs of random cards to try to get what you wanted. For the first con, some cards are just better - if I can choose between putting Darth Vader in my deck or a Stormtrooper, it will be Darth Vader every time. Same with Obi-Wan and Luke. Essentially, if it's someone that you know by name from the movies - you want them in your deck. 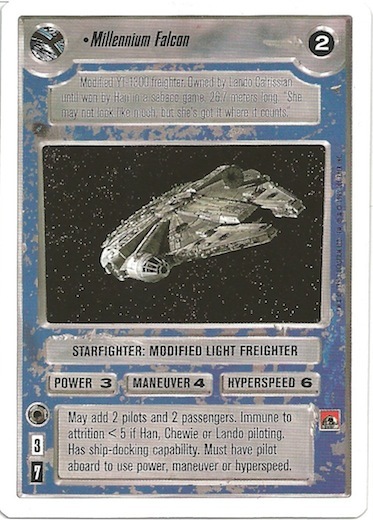 Now this is fine, and all games have some cards that seem (or are) better than others, but it seems much more pronounced in Star Wars than in most non-collectible games. Can you guess the Rarity? Yup Rare1. The third con that I wound up thinking of was that the game can be very confusing when you are initially learning it. There is a lot going on. I've known the game for long enough that I often forget about this, but I was incredibly lost when I first tried to learn it. I think that part of this is because several of the mechanics are pretty unique (so you won't be going, "oh, like in Magic..."), but also the simple fact is that there are a lot of rules - many of them are small or only matter in certain situations, but either way, there are a lot of them. Overall, I give the Star Wars: CCG a 9.5/10. (Really, did this surprise anyone?) In my opinion, it is the best Star Wars game that I have ever played. Though it is out of print, and many other Star Wars games are coming along, I intend to keep my cards, and I will break them out occasionally to play this game which I find myself still enjoying after 15 years. If you are looking for a game with deck construction, or if you are a Star Wars fan, you might at least consider checking out this old gem. If you enjoy games where you get to customize your deck prior to playing, you might also check out Game of Thrones Living Card Game, Lord of the Rings Living Card Game, and (possibly) Existenz: On the Ruins of Chaos. OMG this is so old! But yeah, one of the best CCG of all time. Way better than MTG imo. You never ran out of cards in hand! Too bad it stopped. Decipher did LOTR CCG also, a really good game too! Great review, great game. An all-time great. Is anyone else crossing their fingers that when FFG finally gives us more info on their upcoming Star Wars LCG that they just announce they've acquired Decipher's game mechanics license and are just remaking this? There's precedent for this by FFG remaking Netrunner recently. I mean, why do anything less than one of the best card games ever made? Well, unless they've scratched all of their original thoughts, I thought it was supposed to be a co-op. However, I'm not sure how I would feel about them simply re-making this as an LCG. I'd probably buy some... or all... of what they published. Yeah, no one is really sure if that new game is co-op, pvp, some sort of hybrid, etc now ever since they announced that they were reworking the game, which seemed to coincide with many complaints that the game should've been player vs player. FFG also has removed all info related to it being co-op, for example removing the '1-4 players' from the side of the game box at some con. Anyway, I'd play a co-op SW card game, I'd play a new pvp SW card game, but I'd DEFINITELY play a SW pvp card game of FFG's take on Decipher's wonderful game system. Josh great review. 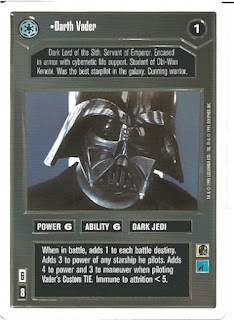 I'm the owner of CategoryOneGames.com and we specialize in Star Wars CCG. I like your look at it. The game is still going strong with over 80 people at an event in January and the Worlds event in Germany this year. There is a Players Committee that has helped to keep the game alive and releases Virtual Sets around two to three times a year. 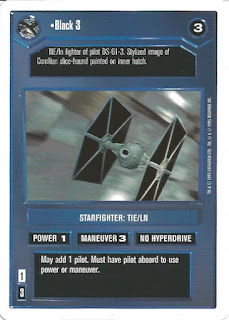 If you want to know more about the Star Wars CCG, contact me. Good review of an old game. I still keep all my original Star Trek and Star Wars CCGs stuff just in case. Nice, I played this with my son way back, still have the game. I will pull it out and play it again! That would all depend on what you have. eBay would probably answer that question much more accurately than I could. If your cards are from the first few sets, then probably not terribly much. If they're from the last few sets, then they might be worth quite a bit.